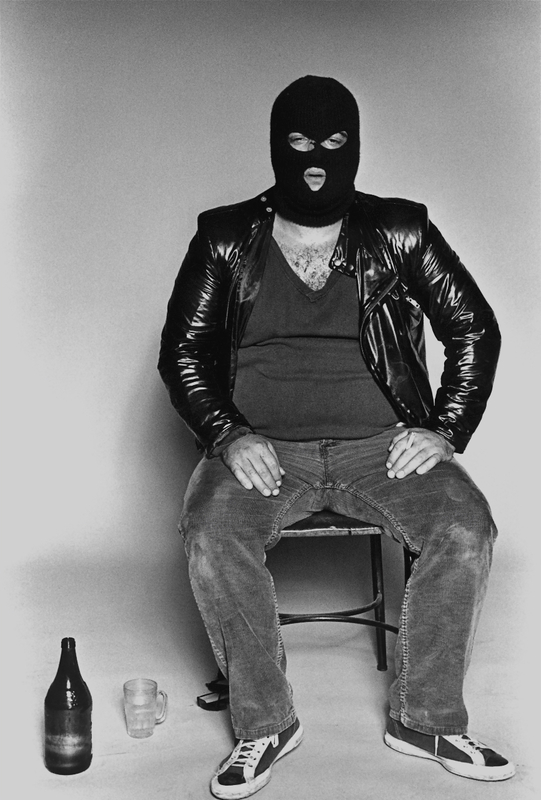 — In early September 1981 I spotted John Belushi in the New York after hours club AM PM. I asked him when he was going to do a photo session with me for my series Bad Boys: A Compendium of Punks, Poets and Politicians. He said, “Now”. I didn’t believe him, until upon returning home at six am I saw a limousine waiting in front of my building. I turned on the music as John and his entourage filed into my loft. I then directed John to an area lit by strobe lights and I began shooting. John paced around like a caged animal, fidgeting incessantly. He seemed unable to sit still for my camera, uncanny for someone known for being deliberate and fluid when performing. “Where are the props?”, he queried. I first gave him sunglasses, then a scarf. He requested a beer, then a glass. After donning a black wool ski mask that he took off a nearby mannequin, he settled into a chair. Only his eyes and mouth peeked through the openings in the mask. The large, ominous and anonymous ‘executioner’ had finally reached his comfort zone.